Today is drenched in Seattle rain; gray blankets of clouds drape over the cityscape and the wind is whipping remnant leaves about and collapsing the emboldened umbrella. Even for us who believe that “there is no such thing as bad weather, only being poorly dressed,” this has been a day to stay in doors. For every puddle formed, a tea kettle has whistled. With every heavy drop of rain, a child has sighed a resigned breath onto the window pane, the weather affirming mommas’ requests to stay inside. This has been a day to gather around the hearth-places to find warmth and inspiration. For centuries the hearth was considered an integral part of a home, often its central or most important feature. These brick lined structures were a place of survival from where nourishment and story came; food would be served from this seat of heat with a healthy side of laughter and conversation. This was the gathering place. This is where socks and tears were dried. This was the place that centered and from which one left to go out into the world. In an era of central heating and warmth that comes from pushing a button, hearths are no longer a required feature in a home. It is far more common to have the television set inlaid in a prominent wall, which then becomes the family gathering place. Indeed, one can turn on a channel that emulates the spark and sound of a crackling fire to enjoy the perceived warmth of a fire place. In the context of these modern conveniences, how do we still create a place that not only provides warmth, but also inspiration and reminders of all that nourishes us? These places need not provide a literal heat, but something that warms the heart and soul, and provides both renewal and reminders of all that is most dear. I have two such hearth-places in my home. Our primary hearth-place is appropriately in our kitchen, which is central to our home in its location and in its function to our family. In this room we cook, paint, draw, play games, eat our family meals, tell stories, and yes, even cry. Our very old (and very loud) dishwasher provides a lulling hum to the room while our clothes washer and dryer spin and bump along its own chorus. So it is here that I have created our family hearth. 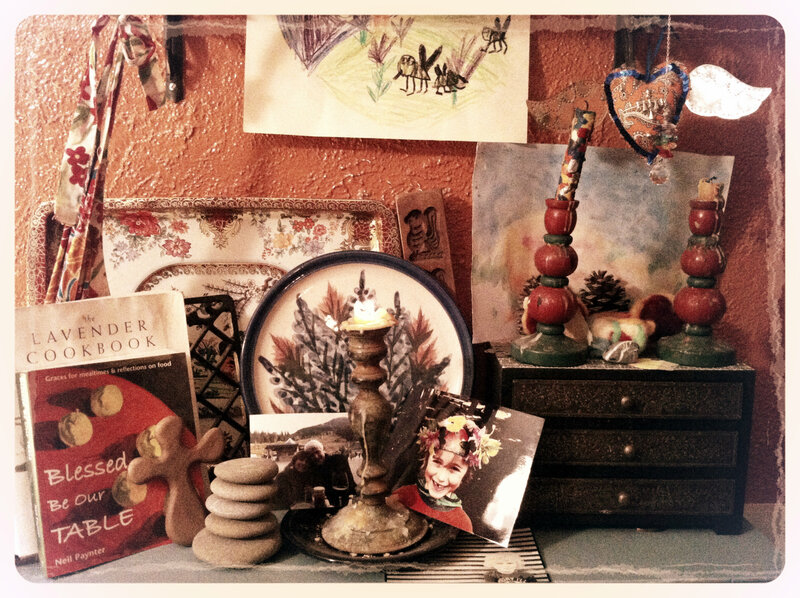 On this lovingly passed-along, blue bookshelf, which is just off from the most center-point of our house, I tend a collection of meaningful items that warm my heart, that affirm our family’s stories, that remind us of loved ones in need of prayer and even hold favored cook books. 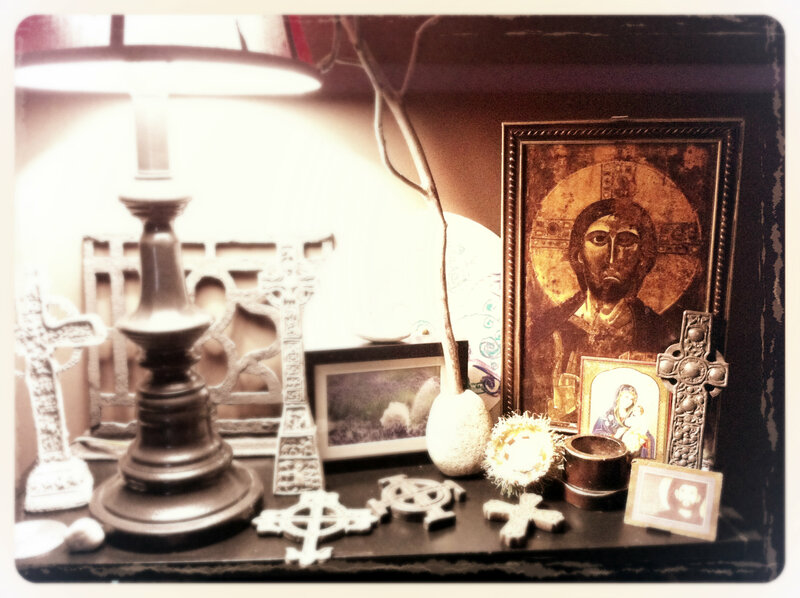 This simple collection warms and brightens my spirit; it guides my memory and affirms the love of my family. The other hearth-place I tend is in my office. I am grateful that I am able to have this room in my home, as it allows me to be in this home I love with the people who are most dear. However, when I enter this space, my mind is activated with the work that fuels me in other vibrant and important ways. Here are my books, my articles, my correspondence, my planning and in many ways, my prayers. So it is here that I have assembled a hearth-place that puts fire to my spirit and ignites my soul. It reminds me of the passions behind my work and rekindles memories of places and people so dear. At this hearth I am renewed by my faith and The Story that fuels me to get up each day and do the work I do outside of our home. This place centers me, feeds me and sends me out into the world prepared to do the work I was uniquely created to do. The Celtic tradition perceives God’s presence in and through all the mundane and domestic details of daily life. No moment in the daily round is too small or insignificant to be an occasion to experience Spirit. The most common of chore is seen as an occasion to be in the posture of prayer. This prayer was offered following the rhythym of awakening and tending to the hearth. May this blessing be an invitation to you to transform a place in your home that daily calls you to the warmth of all the gifts you have been given and urges you to share what you have with the world. But the Holy Son of God to shield me…. How to create a Hearth-Place in your home. Decide on a location in your home. Which room do you naturally gravitate towards when in need of warmth and nourishment? Where do you instinctively go to be cozy, to read, to be told a story? Use a defined space to create your hearth-place. Tops of book shelves, a shelf in a book shelf, the top of a piano, a wall shelf or the top of a dresser can all work to provide the structure. Assemble items that remind you of essential times in your life or represent loved ones near or far. Bring in a bit of the natural world to this as well as it anchors us within the greater community of things of which we are apart. Invite your family to participate in this gathering! Light a candle in this space. This serves as a reminder of the warmth we have been given in these many gifts of people and places. It renews the soul and activates the space. Make it dynamic! The hearth-place is a dynamic place that can reflect the change in seasons, people in need of thoughts and prayers, as well as current stories and reflections. Enjoy bringing new items to this space.